We go through a lot of game ideas here, which means we do a lot of prototyping. One of the most common questions we see new designers ask is what the best way to prototype certain components is, so we thought we would put together a bit of a guide on the subject. This is drawing on our experience, but if you have had a different experience we would love to hear from you. Published card games usually come in 300 or 310gsm blue- or black-core cardstock. The number is “grams per square metre”, a way to weigh the cards easily. The solid core on the cardstock gives the cards a nice snap and stops players being able to see through the paper and guess what card is in their opponent’s hand. The easiest card size to work with at the prototyping stage is standard poker sized. This is 64x89mm (or 2.5×3.5″) and is used by Magic: The Gathering and every Fantasy Flight Games LCG. The other size that is commonly used is found on Japanese TCGs like Yu-Gi-Oh. That is 59x86mm (2.25×3.25″). This is what our cards look like in prototype format. To prototype cards, gather as many old unused CCG/TCG cards from one game and put them into sleeves. I prefer opaque ProMatte sleeves because they shuffle well and are opaque to better hide that you are really using old Lord of the Rings TCG cards, or the excess cards from your third Android: Netrunner core set. Set up your cards using one of the many programs discussed below. Print them on standard paper in a size slightly smaller than the above (try 62x87mm for standard poker sized sleeves), cut them out, and slide each one into a card sleeve that already contains a card. Don’t bother rounding the corners nicely at this stage! Microsoft Word is excellent for simple prototyping. Increase your borders to your printable limit, insert a Table, select the whole Table and right click on it, change the column width to 62mm, change the row height from “at least” to “always” and set it to 87mm. Any bigger and you will have to be very careful with your cutting or else it won’t fit in your sleeves. Use at least font size 14 for information that must be read across the table; size 11 for information a player can read in their hand; size 9 and italic for flavour text. To change information on the cards, simply reprint and replace. It can be helpful to make a note at the bottom of the card to indicate which version it is, but at the initial stages of prototyping this will just be a waste of your time. Leave values that you aren’t quite settled on yet blank, or change their font to a faint grey. Pencil in the value when you print out the cards. That way you can easily replace the values by erasing and rewriting, rather than having to print them out all over again. Once you are past the initial playtest stage, you probably want to start adding art or graphics design to the cards. You don’t need Photoshop or an expensive graphics suite to do this. For our graphics design, we use The GIMP, an open source free to download graphics software package. Set up a new file, open Advanced Settings and change the dpi (dots per inch) to 300 (which is standard for printers), and change the size to 2.5″x3.5″ (inches instead of pixels). Your cards will retain this information so that when you import them into Word, they will resize themselves to 2.5×3.5″ automatically. Create a new layer with “Layer Fill Type” set to white. Use the select tool, but make sure “Rounded Corners” is ticked and set to 30px (which is close enough to 1/8″ for our purposes). Select your new white layer using this tool (notice the nice rounded corners). Use the Fill tool to fill this inner selection with black. Click back on your selection, but this time increase Position from 0,0 to 1,1 and reduce your Size by 2 on each axis. Click “Delete” on your keyboard. This will erase most of the black, leaving a nice clean “edge” around your card. As long as you leave this layer as the top layer, your cards will have pre-rounded corners. You don’t have to trim these rounded corners off when you print them out. But if you want to add rounded corners to your printed cards, you can cut them out with scissors or invest in a corner cutter (to literally cut corners – oh no…) like the Sunstar Kadomaru Pro (which is our favourite tool of all time). Use the “Small” corner cutting side on this to punch perfect edges on your cards. The GIMP isn’t perfect. It’s difficult to learn and clunky at times, and things you could do in Photoshop in seconds take minutes (eg adding Stroke to anything) in this program. Text doesn’t justify properly, and it doesn’t retain text information when you rotate it. Google will be your friend to figure out how to do anything in the program and it has some annoying default settings. It is hard to add layer masks, and you can’t have separate groups of locked objects. But to get a rough design, it will do. Some people swear by nanDECK to prototype cards, thought personally I haven’t used it. You can find some tips at this link though. Let me know if it was helpful! When you are at this early stage of playtesting, do not commission art. Trust us. We love commissioning art, and love working with artists, but we would have left it a lot later on Tempest if we had been told that earlier. Art is expensive and it commits you to the game (or to elements of the game) like nothing else. It also makes your game undesirable to publishers, who might have preferred to hire their own artists. Instead, take advantage of the multiple sources of free art available on the internet. As a case study, take a look at this incredible example of card design progression for the hit game, Unfair. Commissioning art locks you into that game concept, and those cards. It invests you in the game and prevents you from letting a bad idea die. Having an art debt does not look attractive to publishers. They may love your game but want to commission their own art, or love your mechanics and want to retheme your game. Guess what? If you have art, you are less attractive, not more. Especially if you have promised and signed royalties to the artists. Our cards with a bit of hand-drawn crayon art added, using The GIMP to create a design. Fonts: Most fonts can be used free for noncommercial purposes. That means you can go on a website like 1001fonts.com and locate a font you like the look of – all without paying for it. If you are planning to self-publish, note that most free fonts will cost you to buy a commercial license. Those font creators need to be paid for their art too! Use size 14 font for any words that need to be seen when on the table; size 12 for any words needing to be read in hand; and size 10 can be used for flavour text (not really necessary at playtest level). Icons: One of the best resources for game designers is game-icons.net. This website has thousands of icons available under a Creative Commons license. So long as you give credit (as indicated on their site), you can use or modify these icons – perfect for both playtesting and self-publishing. Other sites are The Noun Project (free with credit, can pay to get royalty free) and Flat Icon. Draw it yourself: For Tempest, we drew all of our playtest art ourselves. We wanted to do something to clearly show it was playtest art, and so we grabbed a box of crayons and spent two hours in front of Netflix while we drew simple pictures of each of our cards. 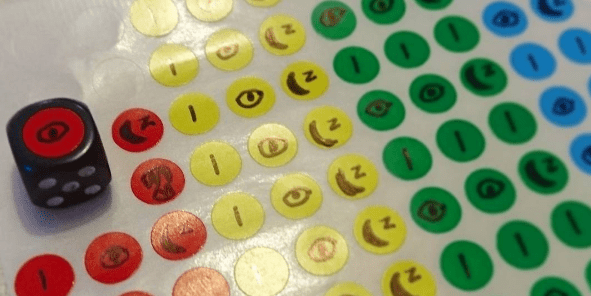 Crayons or coloured markers are great because they give you colour, which can be a helpful cue to testers to distinguish cards. Try to draw the art at least twice the size you intend to shrink it down to, then scan at 300dpi and import it to your graphics program. For crayon art, we found that doubling the art layer and using the “multiply” setting on 50% gave the most vibrant results. “But I’m a bad artist!” We hear you say. No! You are an unpracticed artist. There is something special about a prototype game with art done by the designer – it shows passion! And it can be hilarious. Don’t be a perfectionist, just give a vibe of your cards. Stock Websites: You can use websites like Adobe Stock, Shutterstock or iPhoto to get pictures you like the look of, but those cost money or are watermarked. Instead, you can use pexels.com and pixabay.com (which have fewer stock photos but are under Creative Commons licenses). Toss the stock images into your graphics program and throw a filter over them to give them a quick and dirty painted look. In The GIMP, look under “Filters > Artistic > Oilify”. Finished Art: Websites like deviantArt and ArtStation are communities for artists, with a massive range of different artistic styles, qualities and skill levels. There is also a ton of stock imagery on deviantArt, under various types of licenses. Usually the photographer of those images just wants a link to their site, but it’s worth checking. You can also use art that has been used in other games, or still-frames from movies or anime. It is worth remembering that if you are just playing the game with friends, you are not using any art for a commercial purpose. If you are demoing to a publisher, make sure you make clear it is playtest art. If you are offering a free print-and-play with the intention of using it to advertise your upcoming game, don’t use art you haven’t paid for. Use common sense and, basically, just don’t claim credit for something you didn’t do or pay for. Google Images: You can also search Google Images for art. This will usually link you to deviantArt or to a “free” wallpaper website, but it can be really good for finding high resolution images. Just adjust your search parameters to high resolution, and don’t trust their judgment of whether an image is license free or not. Another good thing about Google Images is that it suggests additional search words to focus your search. Jeremy Commandeur’s post over at Board Game Builders has some other great resources for free art that have and haven’t been covered here already. If your game has normal dice without custom faces, just use normal dice. If your game has 6 different symbols on each face of its dice, change all references in your prototype to those symbols to icons of pipped dice. A publisher or playtester will understand that the 6 will be a smiley face later on. Don’t make your prototype harder to recreate than it needs to be. Okay, so that’s done now. So you have custom dice, with custom faces – perhaps a 12-sided dice with a tooth symbol, two snowflakes, three blood drops, and six blank faces. What size should you make them? If you are using a non-standard dice (ie anything that is not a 6-sided dice), you don’t have much choice as to size. Everything is pretty standard. If you are using 6-sided dice, you have many options. 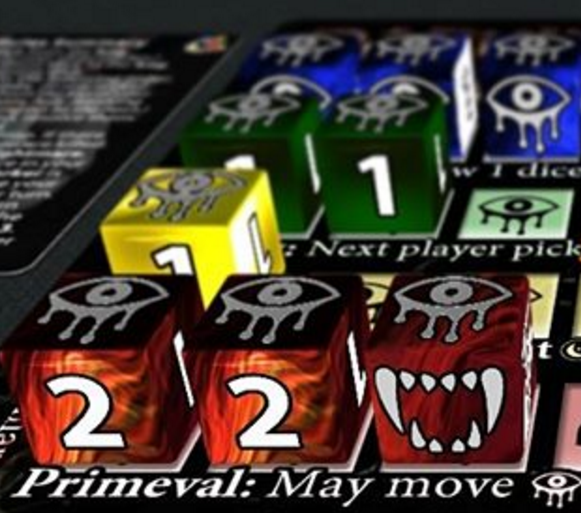 Darkly Dreaming has 72 dice in its playtest set. That’s a lot of dice, so we went with 12mm sized ones for their low price. Dead of Winter does the same thing with its white dice. Otherwise, the standard size for dice in a game is 16mm. You can find those pretty cheap in white with black pips or black with white pips. Stickers: Get your dice and buy yourself some little round labels. Ours were 8mm colour labels from an office supply store. Use a permanent marker with a sharp tip to draw the symbols you need on those labels, then stick them to your dice. In our case, 8mm labels fit perfectly to 12mm dice (as the dice had 1mm rounded edges). Engraving: If you know the right people, you can get dice laser etched for you. This works out to be rather expensive, so you should keep these to a minimum number. A search online for “custom engraved dice” will pull up many results. You’ll be looking at $2-3 per dice face. Casting in Resin or Acrylic: Nope. Just don’t do this. Manufacturers won’t talk to you without a bulk order, and the molds are too expensive to use for prototypes. You might look at this if you have lots of dice you need done for review copies, but don’t do this at the start. Rattlebones Dice: The BoardGameGeek Store sells these dice in sets of three, and they are quite pricy. It’s cool, but stickers are a cheaper option. When you are buying dice, you can buy them in bulk from eBay or Amazon. Don’t make our mistake and buy the beautiful swirly dice with unique colours for prototypes. You can often get plain white/black dice for half to a third of that price, even from the same manufacturer. An example of one of our boards from Darkly Dreaming, using paper. For boards, when you first design them you will want to use paper. Use Microsoft Word with the “Insert Text Box” tool to lay out the various “sections” of the board, or hand draw it yourself on a sheet of paper. If you want to add a bit of art to the board, you can use The GIMP (as with cards above), then print it across multiple pieces of paper, or take it to an office supply store to print in A3 size or larger. You can use the L setting on the Kadomaru Pro corner rounder (see “Cards” above) to make nice round corners on this too. Once you have settled on a board design, and it is seeing a lot of wear, you can laminate the board or have it printed on cardstock. 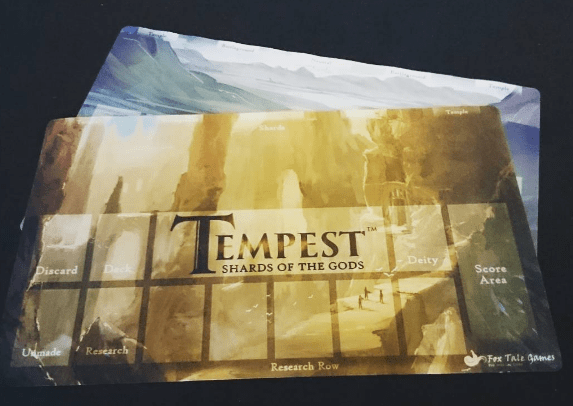 Another alternative, if you have a graphically designed board and you want to print it on a card game playmat, is to print it to neoprene rubber (mouse pad material). Dye sublimation printing allows art to be printed on cotton fabric, which is affixed to a neoprene backing. This looks excellent when you are demoing your game, and it rolls up nicely for storage. A dye sublimation printer is expensive, but you can commission a playmat from someone who already owns such a printer for around US$25-30. Try searching eBay for “custom playmat” or “custom neoprene”. Make sure you are very clear what dimensions are required, including any image bleed – otherwise the printer will stretch your image to fit or cut off a valuable section of it, and you will have to order one again. Our dye sublimated player boards. The two most common tiles used in board games are square and hexagon (because they tessellate perfectly). Also used are rectangles (eg dominoes). These are printed on punchboard (1-1.5mm thick) or cut from wood, giving them nice heft and the ability to slide or be handled roughly without bending, and enough weight to remain stable while things are moved on top of them. Unless you are making a dexterity game, where you need to stack tiles, then when you first design your game, you should look into using paper tiles. But for playtesting, this won’t work forever. There’s a reason people use thick tiles. Paper slides everywhere, overlaps itself, moves at the lightest breeze, and bends. You could probably find hexagon or square tiles from another game and put stickers on them, or use foam, or have a laser-etching machine cut them out for you. You could even use a foam board and a craft knife to construct your own. But we have found the most useful place to get tiles are from a tiler. Go to a local hardware store and search for bathroom or kitchen tiles. These tend to be small, come in multiple numbers, and are not pricy. You can get faux metal tiles that are thin, lighter than clay tiles, and strong. Use a permanent marker or stickers to affix details to these tiles. You can also find square wooden tiles from craft stores, but they tend to be a bit pricier, and we have never found a blank hexagon tile there. If you are making the next Patchwork or Xia and you need Tetris-style tiles, you may need to get creative. Cut out foam or cardboard, or get a custom laser cutting service to make you your tiles, but this can be pricy so you might want to work with paper until you have settled on exact shapes. Tokens are produced similarly to tiles: they are printed onto punchboard then cut to shape by a die cutting machine. We don’t have that ability, but what we do tend to have is a ton of other games. You can easily find tokens with $1 or equivalent symbols on them, and larger ones with $5. 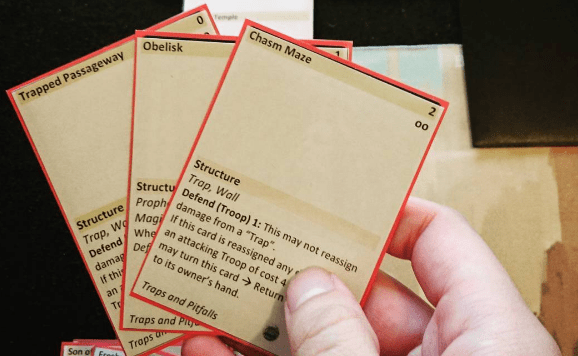 Many games have “damage” tokens also. 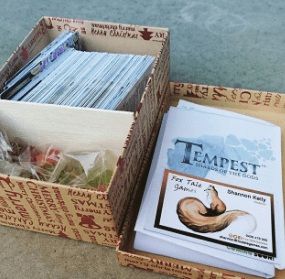 If you have ever invested in a Living Card Game, you will probably have 3 core boxes with all of the extra tokens that brings. However, if you cannot find or do not have any of those, see “Beads, Counters and Cubes” below. You can easily substitute these for tokens. Meeples and miniatures are a little different. The cheapest meeples/bulk-minis are beads, counters and cubes (see below), but a close second is zombies from the game Zombies! or meeples from the BoardGameGeek Store. Meanwhile, for miniatures, if you have old tactical miniatures games lying around collecting dust, you can grab some of those to use. Otherwise, dollar stores are your friend. You can find chess sets quite cheaply there (which contain loads of pawns as well as your usual assortment of bishops, knights, kings, queens and rooks). If colour is important, you can paint pawns easily. Another thing you can look for in dollar stores is miniatures being sold in the kids section – you know, the place you go for a birthday present for that nephew you don’t really like. Often there will be bags of dinosaurs, solders, farm animals, cars and the like in small sizes at cheap prices. A close second for miniatures is Lego figures. If you have an idea for your own miniatures, and know what they will look like, you can also print them out as paper “standees”. Using Word, insert a new table of 1 column and 4 rows. Change the width of the table to the width you want your standee to be. Change the height of the top and bottom rows to the same as its width (when you overlap these two, they will form a square). Change the height of the middle two rows to between 1 and 2x their width. You can insert artwork into these middle rows (use “Behind Text” on “Text Wrapping” to fit them without stretching the table) and print them out. Cut them out, fold the edges, overlap the top and bottom row and tape them together. Games use these to create an easy visual reference to things like ammo, supplies, cargo, energy, disease outbreaks, zombie plagues, etc. You can get beads easily on eBay (just make sure you get the ones with flat edges, else they will roll everywhere), and the Board Game Geek store sells 8mm translucent cubes in bulk, but it is often easier to buy wooden 1cm cubes from a teaching supplies store or Amazon. That is also a good place to find counting chips, which can be used as tokens. See our use of beads as “monsters” in our tower defence prototype, and our use of paper hex tiles and tokens. You can use beads, counters and cubes for everything in your games. Resources, tokens, miniatures, sometimes dice on the cheap, meeples, first-player markers, etc. Always buy double what you think you will need. It’s better to overspend in this case than need to buy more, and you can always use the spares for other projects. There is no need to go overboard when it comes to boxes. When you first playtest something, get yourself a box (shoe boxes work, or you could get a smaller box from a dollar store). Put everything in this box so that you don’t lose it! That may sound self-evident, but we’ve lost many a bead by not securing it. Likewise, you can use plastic zip-lock bags to hold tokens, tiles, cards, etc. The “snack” sized bags are perfect. Even if you leave the idea behind, and you cannibalise the playtest pieces from it, you should leave a note of what parts you took out, in case you ever want to go back to it in future. there is many a time when we’ve left a concept behind only to discover it has been bubbling away in our heads for a year and it rises back up fully formed one day. When you begin to take your game to conventions or playtest groups, you can mark up your box with some permanent marker. Alternatively, you could print out some art from your game (from stock images or hand-drawn – see “Art” above) and use two surface spray adhesive (like Selleys Spray Contact Adhesive) to fix it to your box. This gives a nice visual cue to people to ask “oooh, what’s that in there?” and when you are playtesting the game you can stand the box lid up to lure people to your table. It may be tempting to use another game box as your own, but there is one thing we have learned about doing this: people always notice. Whether because they want to play the game that should be in the box instead of your own, or they invite comparisons between your game and the one on the box, or even just laugh at your misuse of the other box, it’s not really worth doing this. You also miss the opportunity for free advertising as above. Of course, this doesn’t matter if you cover the original box completely. One recommendation is to spray paint the original box or laminate it, then none of the original art will show through if your paper is too thin. Dice created in Tabletopia for Darkly Dreaming’s playtests. Finally, we would be remiss not to mention this fantastic resource. Tabletopia is a program that allows designers to import art assets, and play around on a virtual tabletop. 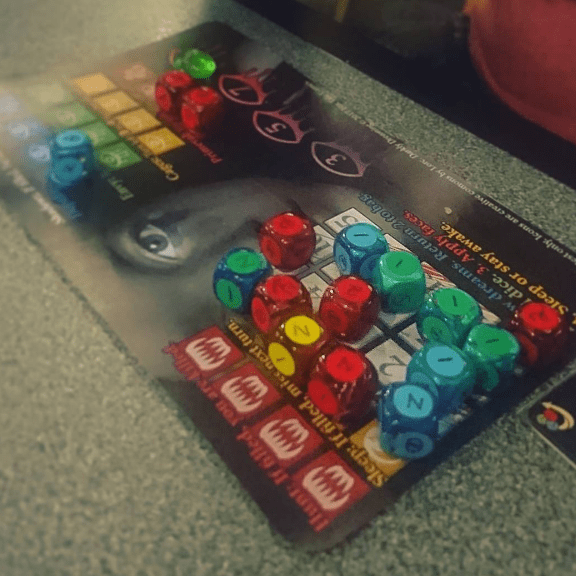 It allows you to create custom dice, playtest with people across the Internet, print and replace cards easily, play around with more expensive components, large boards, tiles, etc without spending any money. For a new designer, this is definitely worth checking out. You don’t even need to download it on Steam, as it first appears. It operates entirely in browser (albeit in Firefox, Safari or Internet Explorer only). As an example, you can see our playtest of Darkly Dreaming in Tabletopia here. Thanks for having a read! Hopefully some of this was helpful to you. If there is anything we missed, or components you can’t find an answer to here, let us know or ask in the comments below. We’d be happy to help if we can!